This is the Quilt Along of the Rainbow Star pattern in the Bold colorway. This version of the pattern is designed by Liza Lucy and is perfect for all skill levels. The focus is on color harmony and placement. Finished size is 78" x 78". 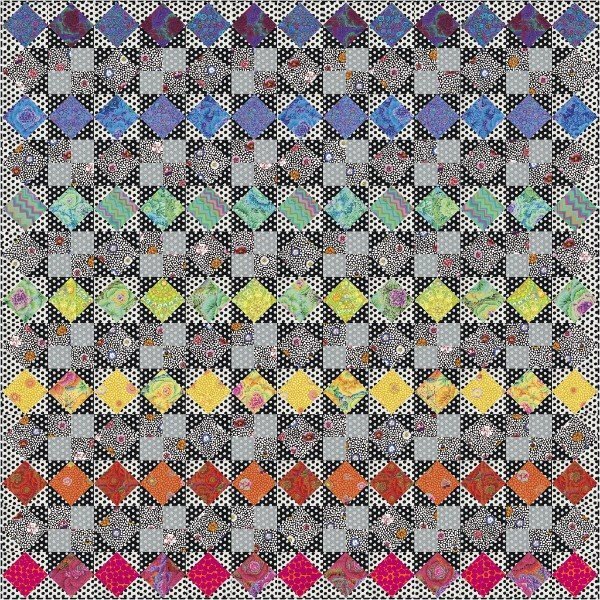 A complete fabric kit (9.5 yards) will be shipped in April/May 2019 and the quilt-along will begin with the first pattern release on June 3rd and end with the last release on July 15th. An initial non-refundable enrollment fee of $10 applies, and another payment of $95 is due when fabrics are ready to ship. You will be notified when the second payment is due. The price includes domestic postage for all 50 states. Shipping to Canada is an additional $15 and Overseas addresses are $25. Bonus swag includes an exclusive Kaffe Quilt Along reusable tote and an exclusive fabric quilt label. If you prefer to divide up the $95 for the fabric into monthly payments $33 for February through April, you can sign up for it here. Please click first on the enrollment "Buy" button to enroll, and second on the fabric pack installment buy button to sign up for the automated payment plan for the three month leading up to shipment. International prices for the payment plan include installments for international shipping. WA state customers, please choose option with sales tax in drop-down menu. This is the Quilt Along of the Rainbow Star pattern in the Sunset colorway. 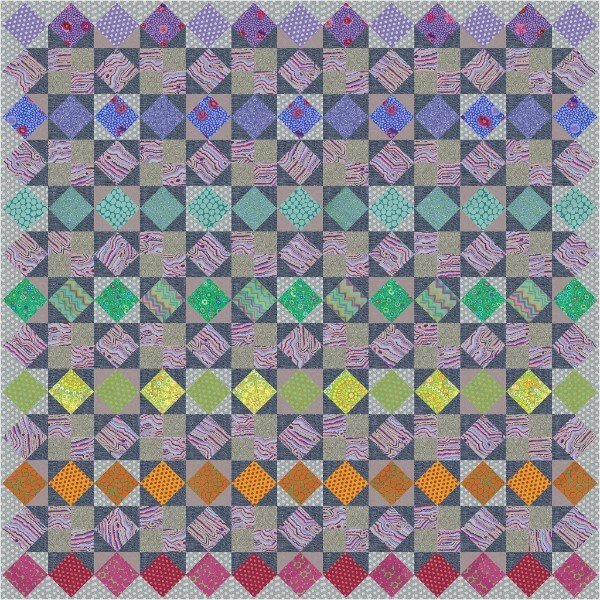 This version is designed by Kaffe Fassett and is perfect for all skill levels. The focus is on color harmony and placement. Finished size is 78" x 78". A complete fabric pack (9-5/8 yards) will be shipped in April/May 2019 and the quilt-along will begin with the first pattern release on June 3rd and end with the last release on July 15th. An initial non-refundable enrollment fee of $10 applies, and another payment of $95 is due when fabrics are ready to ship. You will be notified when the second payment is due. The price includes domestic postage for all 50 states. Shipping to Canada is an additional $15 and Overseas addresses are $25. Bonus swag includes an exclusive Kaffe Quilt Along reusable tote and an exclusive fabric quilt label.